Friesian Crazy has Moved! All the same great content with new features and a new design! Visit us at www.friesiancrazy.com to see the new site. "The Fenway Foundation for Friesian Horses is a not for profit corporation created to preserve and enhance the longevity and quality of life of Friesian horses by accruing pertinent equine, more specifically Friesian, information to educate the public and offering assistance regarding Friesian horses and their owners throughout North America." A very exciting new organization and a positive step towards continuing and improving Friesian health and genetics. Take a look at their website at: Fenway Foundation for Friesian Horses. "Tsjerk 328, not only are his breeding values for conformation still among the highest, his list of predicate worthy progeny is impressive. As many as 483 offspring were ster, an unprecedented number in the breeding of Friesian horses. Nine daughters received the Model predicate and 25 Tsjerk 328 descendants earned the Sport Predicate. ...Tsjerk 328 has already approved six grandsons, three via son Andries 415 and three Tsjerk 328 through subsidiaries, including the two-time champion of the stallion Uldrik 457. It can be established that the influence of Tsjerk 328 on the Friesian Horse Breed to be quite meaningful." Two KFPS registered Friesian horses (a mare and stallion) living in the Northeast are being rehabilitated after suffering from the neglect of their owners. Members of the Northeast Friesian Horse Club have been assisting in the horse's rehabilitation are are asking for donations to help aid in their recovery. Donations for the recovery of these two horses can be sent to FHANA. Any remainder of donations not being used will be set aside in a fund to help in the future rescue and recovery of abused or neglected Friesians. Uldrik 457 (Dries 421 x Tsjerk 328) has become the Champion of the 2011 Stallion Show in Leeuwarden for the second year running! Udrik's grandsire, Jasper 322 recently became one of the youngest stallions ever to receive the prestigious Preferent predicate. Reserve Champion went to Tsjalle 454 (Mintse 384 x Brandus 345). Other stallion finalists included: Andries 415, Aan 416, Harmen 424, Haitse 425, Gjalt 426, Jerke 434, Maurus 441, Maurits 437, Pier 448, Norbert 444, Anders 451, Uldrik 457, Tsjalle 454, Wimer 461 and Wytse 462. Watch the 2011 FPS Stallion Show Live! Can't make it to the Friesian Stallion Show this year? The Stallion Show can now be seen live online on the Frisian-language TV station website Omrop Fryslan, on Saturday, January 8th. The United States Central Examination has begun, with five young stallions currently being evaluated at the DG Bar Ranch in Hanford, CA. This is the fourth year a Central Exam has been held in the United States for North American bred stallions who have passed the first round of judging. Participants include: Toby fan Bonny View (Tije 401 x Tsjerk 328P), Ruben van Erve Poortstad (Aan 416 x Fabe 348), Tettrino van het Kasteel (Jasper 366P x Feitse 293P), Zander fan Camelot (Hinne 427 x Jasper 366P), Wybren fan Northster (Feike 395 x Wicher 334). The United States Equestrian Federation (USEF) is proposing a rule change affecting the definition of the USEF term, "Part-bred Friesian." Currently horses must have at least 50% pure bred Friesian blood and one pure-bred Friesian parent to be eligible for designation as a Part-bred Friesian. The proposed change would lower the required pure blood amount to 25%, and allow a purebred parent to occur within two generations of the competing horse. Both FHANA and the FHS have publicly objected to the proposed change and has called upon its members to voice their opposition to the rule change to the USEF. A list of proposed rule changes impacting the Friesian division can be found on the USEF's website, here. What do you think about the changes EU regulations have made to the FPS and FPZV? Participate in this online survey, created as a senior capstone project by Ashton Clapp of Cazenovia College. The results of the Friesian Horse Health Survey, distributed to FHANA members last year, are now available for public perusal. The research project "A Survey of the Health Issues of Friesian Horses" by Kelsey Evans was sponsored by training facility Seacoast Farm and was concieved, conducted and analyzed over approximately a year and a half as a part of a student project,for the benefit and use by the Friesian community. FHANA has reported that a business calling itself Golden Friesians is posing as a seller of Friesian horses using stolen information and photos from Witteveen and Legacy Friesians. This is a SCAM. The people running the website do not own any of the Friesians advertised and cannot sell them to you. Please spread the word so that no one falls prey to this fraudulent business. You all know about the KFPS main studbook, and probably most of you know about the hotly-debated B-books, but what about the D-book? Get up to date on this recently formed KFPS studbook and what horses are eligible for it in the Friesian Crazy Encyclopedia. Joe and Joan Fernandez of La Jolla, CA have purchased Monte 378 Sport (Teunis 332 x Hannes 296). Monte is 14 years old, was approved on offspring in 2005 and received the Sport predicate in 2008. He is scheduled to arrive in North America after the 2010 September stallion show, and will stand for breeding in 2011. For more information, please visit Friesian Focus, LLC. The KFPS has changed the rules regarding the provisional status for Crown and Model. Previously, a mare was given one year after attaining the title Provisional to complete the required IBOP test. Now, according to the changes, once a mare has been judged provisional, she will have an unlimited time period afterwards to complete the IBOP. Having a hard time finding reliable, up to date information on Friesian stallions? It's a big job to keep track of all the stallions, their scores, who they are owned by and their registration status, especially when that information isn't always readily available. Now the Friesian community has a chance to keep itself informed with an open access wiki allowing any Friesian enthusiast to add information and photos about a particular Friesian stallion, as well as research potential breeding sires and Friesian lineages. As with any open access website, we have to be careful to first and foremost contribute truthful and relevant information, maintain accurate citations, and use photographs only with permission. It is up to us as a community to uphold a high standard for information, and correct any misinformation by others. So if you have been wishing you could contribute your small part to the Friesian community, start now with the contribution of a factoid or photo and begin spreading the word! Visit & contribute to the new Stallion Directory. Four stallions approved on offspring. Congratulations to Feike 395, Arjen 417, Eibert 419, and Dries 421 who have been evaluated and approved on offspring. Dries' offspring showed the highest scores, giving their sire a 108 for exterior and 109 for sport aptitude, against an average of 100 for both scores. Unfortunately stallions Ymte 407 and Botte 414 were unapproved on offspring. The offspring approval of Bientse 418 is on hold. Iron Spring Farm of Coatesville, PA has purchased approved stallion Maeije 440 (Beart 411 x Goffert 369). Maeije was approved in 2007 and showed high scores with a final of 81.5; he has not yet been approved on offspring. Five young stallions of the 22 which were vying for registry approval have passed the testing of the Central Inspection this November. The new inductees are: Tsjalle 454 (Mintse 384 x Brandus 354), Take 455 (Jakob 302 x Oltman 317), Tymon 456 (Andries 415 x Leffert 306), Uldrik 457 (Dries 421 x Tsjerk 328), and Uwe 458 (Beart 411 x Bonne 341). We are please to announce that all Friesian owners who participate in the Friesian Horse Health Survey, and all horse owners who participate in the General Horse Health Survey will be automatically entered into a raffle, to be drawn at the close of both surveys. Prizes currently include a lovely sterling silver Friesian necklace by Susan Werner of Dragons Fly Designs. Susan's pendants are one of a kind, each one made by hand, and are perfect for Friesian lovers. 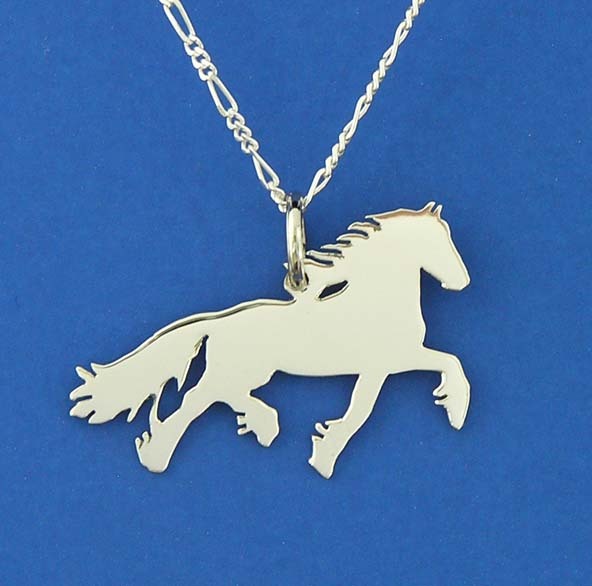 Custom pendants based upon photographs of your own horse or pet are also offered. Take a look at pendants from Dragons Fly Designs at her DeviantArt and Flickr pages, as well as her brand new DragonsFly Designs website. If you are an artist interested in gaining some exposure by offering a piece of your work in the raffle, please drop me an e-mail for more information: friesiancrazy@gmail.com. Thank you. Interested in the health and wellness of the Friesian horse? The Friesian Health Survey and research project has been developed to begin cataloguing the types of health issues which generally affect Friesian horses. The goal is to pinpoint the ailments most common to Friesians and to encourage further research into the cause, treatment and prevention of specific issues which detrimentally affect the breed. Own a non-Friesian? You can help too by taking the nearly identical General Horse Health Survey. This will help establish a base for comparison with the Friesian. Please distribute this to others who would be interested! Larger numbers mean more accurate results. This project is being undertaken with the support of Sterling College and with pending sponsorship by FHANA. Thank you very much for your interest and participation. If you have any questions about this survey, the process or the research, please feel free to e-mail me at friesiancrazy@gmail.com. KFPS Approved stallion Heinse 354 (Leffert 306 P x Dimer 285), owned by Iron Spring Farm, died May 20th, 2009 of colic. He leaves three approved sons: Wisse 408, Bente 412, and Meinse 439. Meinse 439 was recently imported to the U.S. and also stands at Iron Spring Farm. Our condolences to Mary Alice Malone and Iron Spring Farm, Heinse's death is a great loss to the Friesian community. He will be missed. KFPS Approved stallion Nanning 374 has been released by the USDA for breeding. This comes after an outbreak of CEM, a reproductive disease which was detected in Nanning and 11 other stallions in the United States. Nanning's owners Scott and Shelley Kelnhofer announced this week that Nanning has now tested negative for CEM and with clearance from the US Department of Agriculture, is now cleared for breeding once more. Phryso, the Dutch Friesian magazine, will be celebrating it's 60th anniversary this year, and to celebrate will be mailing out English translations of the magazine to international FPS members. These articles have been translated by Anneke van de Ijssel and may be a continued service in the future. Thanks Anneke for giving us access to this great information! Anders 451 (Adel 357 x Ouke 313), Reinder 452 (Aan 416 x Sierk 326), Sjouke 453 (Doaitsen 420 x Jelte 365) finished their testing period with a thumbs-up in April. All three stallions showed a proficiency for sport, with Anders 451 aiming to compete in Grand Prix at the World Equestrian Games in Kentucky next year. Help Friesian Crazy stay afloat! Do you use FriesianCrazy on regular basis? Read articles? See your farm in our links? This site is run on a volunteer basis and in the red. Please help us out by submitting a $1 (or more!) to help keep the site running. Every bit helps. Thank you. Visit Paardennamen for a list of possible Dutch and Frisian foal names. Looking for great gifts for your Friesian friends? Check out the Art & Gifts Gallery for Friesian themed merchandise of all types. Artwork, books, videos, apparel tack, and more. Go there..